Front Row, Left to Right: Leda Siskind, Dorothy SInclair, Emily Donn, Kerry Barker, Back Row, Left to Right: Randi Tahara, Marla Datz, Kathryn Bickle, Jennifer Lee Laks, Karen Louis, David Datz, Monica Lee, J. Todd Howell, Cinda Adams, Muriel Minot. April 8, 2018 The Moveable Theatre Company held a private table read of an original play by TMTC member Dave Datz, titled "Hackers and Lovers". Set in the current world of digital spying and social media, the play explores the limits of privacy, ethics and friendship. Front Row, Left to Right: J. Todd Howell, Dave Datz, Michael Silva; Back Row, Left to Right: Dee Dee Stevens, Randi Tahara, Ryan Moriarty, Peter Kwong, Jennifer Lee Laks. April 25, 2017, TMTC held a private table read at Universal Studios. 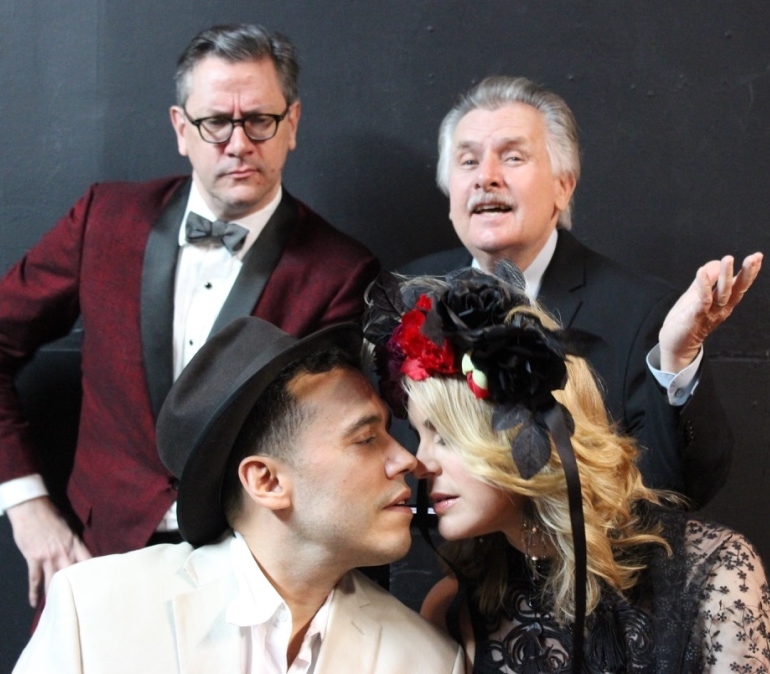 The reading emcompassed two new plays by Joe Estevez (Hobos and Pizza Man) and two lesser-known Tennessee Williams plays (Auto-da-fe and Portrait of a Madonna). Left to Right: Richard E Harris, JC O'Connell, Marbry Steward bring the words of Tennessee Williams to life. Left to Right: Jonathan Medina, David Datz and J Todd Howell. April 22 - May 15, 2016, TMTC members Cheryl Dent, Joe Estevez and Jonathan Medina appeared in a concert version of George Bernard Shaw's Don Juan in Hell , directed by Holly J Witham at The Eclectic Company Theatre in North Hollywood. The short run was a fundraiser for the Eclectic and raised over $3,000 for the theatre. The production was well-received by critcs. NoHo Arts District said the production simply soars and that it delivers boldy and brilliantly. They noted that Jonathan Medina as Don Juan gives a passionate, wise and tranquil performance and that Holly J Witham's direction adds clarity and supple detail. The Tolucan called the production dynamic and named it in their recommended list. They also called Cheryl Dent radiant and Jonathan Medina brilliant. Top Row: David Pinion as The Devil, Joe Estevez as The Statue; Front: Jonathan Medina as Don Juan, Cheryl Dent as Ana. March 1, 2015, playwright Peter Adum was in town for a private table read of his play, Joe McCarthy's Moral Universe. Holly J Witham assembled a cast of TMTC regulars to bring to life this compelling (and fact-based) tale of those who lived and worked in Hollywood, during the days of the infamous HUAC Hearings and Blacklist. From L to R: Michael Francisco, Karen Louis, Kristina Hughes, Brian Vermeire, David Datz, Jonathan Medina. March 2, 2014 TMTC presented The Logophile by Joe Musso. 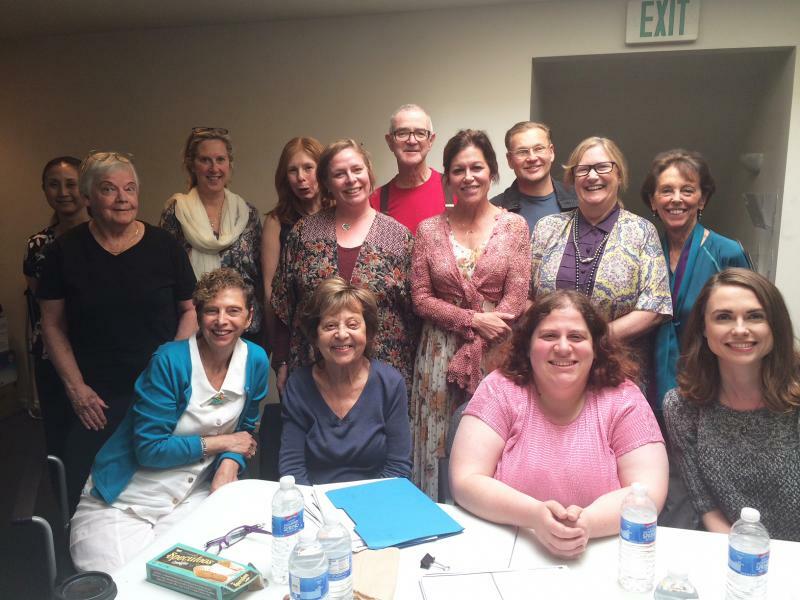 The West Coast Premiere Staged Reading raised over $1,200 for the Friends of the Altadena Library. The play takes place in a haunted New Orleans French Quarter bookstore and involves a shy bookseller, a Civil War ghost, a pretty librarian, a 16th Century Necromancer, a Voodoo Priestess, a mysterious woman with a hidden past - all converging on the bookstore just in time for Mardi Gras week! Playwright Joe Musso was on hand for a Q and A session after the performance. TMTC was also asked to perform an encore of the show - at the Assistance League of Glendale on March 22, 2014. From(L-R): Danny Weitekamp, Cheryl Dent, Shirley McConnell, Nicholas Hosking, Playwright Joe Musso, Dave Datz, Debra Kay Lee, J. Todd Howell and Producer/Director Holly J. Witham. May 5, 2013 TMTC presented Evenings With the Boys in the Backroom by Peter Adum and Joyce Fante. The World Premiere Staged Reading raised over $1,400 for the Friends of the Altadena Library. Set in 1938-40, this original work chronicles the friendships between Hollywood book store owner Stanley Rose and some of his most famous customers: John Fante, William Saroyan, Nathanael West and Carey McWilliams. John Fante's widow, Mrs. Joyce Fante shared the intimate details of the conversations that occurred in Stanley Rose's back room behind the book shop, where some of the most famous figures in American literature during the 1930s talked, drank, played cards and discussed ideas which would inspire their most famous works. The list of characters in this play read like a "Who's Who" of the Los Angeles literary scene during Hollywood's Golden Age. The presentation included a Q and A session with playwright Peter Adum. The cast a crew of Evenings With the Boys in the Backroom. Front Row,L-R: Playwright Peter Adum, Jim Fante, Dan Fante. Second row L-R: Bruce Nehlsen, Karen M. Louis, Joe Estevez, Evelyn Ortiz, Shaun Duke Moosekian, J. Todd Howell, Mary Ann Saranchak, Jared Moreno. October 21, 2012 TMTC presented a staged reading of A.R. Gurney's Later Life. The bittersweet comedy tells the story of two people who meet at a party and realize that they met once before - thirty years earlier. The two performances raised over $840 for the programs of the Friends of the Altadena Library. Front row (L-R): Kristina Hughes, Luce Morgan, Debra Kay Lee, Monica Lee, Shirley McConnell, Karen M. Louis. Back row (L-R): Director Holly J. Witham, David Datz, John Balma, Joe Medalis, Bruce Nehlsen, Harry Herman, Nick Eldredge and Producer Nicholas Hosking. September 23 & 24, 2010, TMTC presented ART, a play by Yasmina Reza, translation by Christopher Hampton at the gallery of LA Contemporary Exhibitions in the heart of Hollywood. Beneficiary Charities of this show were: Being Alive - People With HIV/AIDS Action Coalition Los Angeles Contemporary Exhibitions. Directed by Holly Witham, the comedy revolves around three friends—Serge, Marc and Yvan—who find their previously solid 15-year friendship on shaky ground when Serge, indulging his penchant for modern art, buys a large, expensive, completely white painting. Marc is horrified, and their relationship suffers considerable strain as a result of their differing opinions about what constitutes "art." "...the play...was layered, nuanced and well performed." "Nicholas Hosking, John Balma, and J. Todd Howell are hilarious, touching, and perfectly cast. This was the most entertaining play reading I've been to in a long time." One May 1, 2010, the Altadena Library Foundation, Friends of the Altadena Library and The Moveable Theatre Company held a reception and the world premiere staged reading of the winning entry from the Zane Grey Playwriting Contest, Mary Casey's Surprise Valley. The event took place at the former home of famed Western author Zane Grey in Altadena. A Q and A session with the playwright, cast and director followed the performance. Catering was provided by The Press Restaurant. The event raised over $4,500 for the renovation and expansion of the Altadena Library. To view a video about the day and the play, please click here. Front Row (L-R) Cheryl Dent (Dolly Grey), Richard Horvitz (Young Zane), Angela Schnaible (Jane Withersteen). Back Row (L-R) Ken Baker (Muddy Miser), Kristina Hughes (Dorothy), Adam Donshik (R.C. Grey), Harry Herman (Zane Grey), Christine Kludjian (Death), J. Todd Howell (Lassiter), Trevor Bryant (Buffalo Jones). 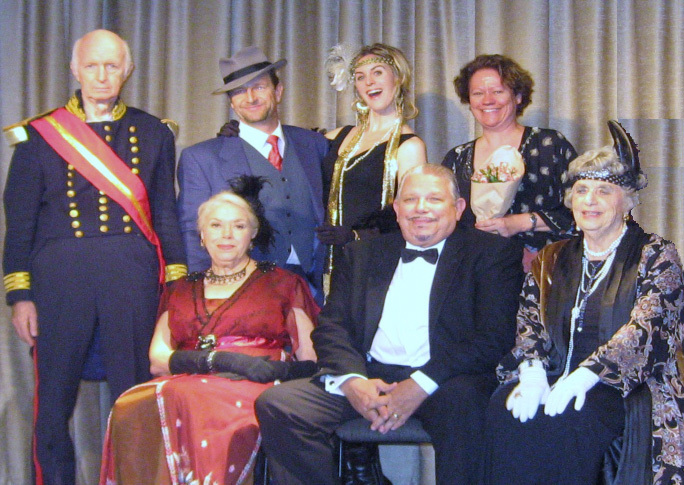 The Moveable Theatre Company presented Two, Times Three - a Program of One-Act Plays from the 1920s on October 23, 24 & 25, 2009 at the Beckman Institute at Caltech and the Pasadena Senior Center. Beneficiary Charities of this show were: Being Alive - People With HIV/AIDS Action Coalition and Pasadena Senior Center. Works by Alice Gerstenberg, Floyd Dell, Neith Boyce, Hutchins Hapgood and Colin Campbell Clemens blended for a program of touching drama and lively humor. The cast included, front row, left to right: Luce Morgan, Bruce Nehlsen, Shirley McConnell. Back row, left to right: Joe Medalis, Nicholas Hosking, Cheryl Dent, Holly J Witham( Producer/Director).